An internet video reportedly showing the confession of a man saying he was a spotter in the deadly shelling of Mariupol is just another low-quality fake created by the Security Service of Ukraine (SBU), the Russian Defense Ministry said. The ministry also hinted that closer examination of the footage actually points to the fact that Ukraine forces were responsible for the bombardment. 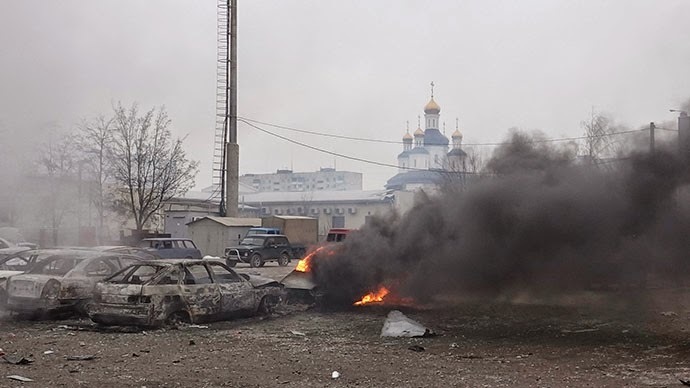 The video was published on the internet on Sunday, one day after shelling in the eastern Ukrainian port city killed at least 30 people and left another 100 injured. “The SBU needed 24 hours to force this story out of a man, which – as we see in the clip – is read by the detainee from a piece of paper located left to the screen,” the statement by the Russian Defense Ministry said. In the video, the person – identified by the SBU as Valery Kirsanov – says he has been working as a spotter for the self-defense forces of the Donetsk People’s Republic since being contacted by a rebel unit commander nicknamed Pepel (“Ash”) two weeks ago. During this period, the man in the video said that several checkpoints of the Ukrainian military were shelled after he sent their coordinates via text messages to the rebels. According to Kirsanov, Saturday’s shelling was also performed according to his sighting, but the militia’s artillery missed the checkpoint on Taganrogskay Street, which they were aiming for. “They were supposed to ‘do the work’ during the night, but they did it in the morning, at around 8:00 AM. I went to see how things were there and told Pepel that they were a kilometer off the mark,” he said in the video. There is also a cut closer to the end of the footage, after which the detainee adds that Pepel is actually“an officer of the Russian army in charge of an artillery battalion” which shelled Mariupol, located in the Donetsk region, on Saturday. “This whole story would be more in place in a spy novel,” the statement said. The ministry also pointed out “a notable inconsistency, which the SBU...neglected for some reason” while crafting its video. “At 1:42 of his ‘confession’ video, Kirsanov said that he sent his contacts the coordinates of a stationary checkpoint of Ukrainian troops in Vinogradnoe village...At 2:22 of the clip, when answering the question: ‘From where did the fire come?’ Kirsanov said with confidence: ‘From the direction of Vinogradnoe.’ In other words, from the direction where the Ukrainian military checkpoint was stationed,” the statement said. The Defense Ministry also pointed out that Vinogradnoe is located 3.5 kilometers away from the shelled residential areas in Mariupol, which is just about the minimum range of Grad missile launchers, which were allegedly used in Saturday’s bombardment. “Further comments on this fake – or as one may call it a 'self-disclosure session' – by the SBU would be excessive,” the statement concluded. The Ukrainian military launched a massive offensive in mid-January, but failed to gain ground despite employing tanks, artillery, and aviation. The Ukrainian conflict began last April when Kiev launched a military operation in the southeastern Donetsk and Lugansk regions, after the regions refused to recognize the country’s new coup-imposed authorities.